When Charlotte Brontë wrote 'The Young Men's Magazine' in 1830, she was l4 years old. She wrote in tiny script to mimic an actual magazine's typeset, and may have used a magnifying glass to help her see her printed words. 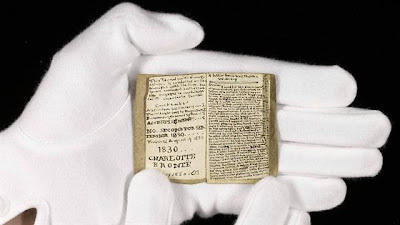 In December, 2011, this tiny 19-page manuscript sold at auction for $1.l Million. The director of the Brontë Parsonage Museum said, "The fact that it's unpublished and unknown makes it extraordinary." The discovery of this minute treasure was unexpected, which makes it all the more thrilling. Often, artefacts or letters surface 'out of the blue' to provide more insight into the mind of an artist or musician we thought we already knew, and our lives become richer for it. Here is a tiny precursor to a master work of literature that Charlotte would write 17 years later. The seeds of Jane Eyre had been hidden from view all these years, but now we see how her creativity mined the gems from her past and incorporated them into her adult fiction. What a wonderful new way to experience Charlotte Brontë. This surprising discovery should encourage a willingness to explore the possibility that more secrets about this remarkable woman have emerged recently as well. Timing is everything. Perhaps the fact that I was able to uncover hidden revelations about this famous family is not unusual at all. As we see from this latest find, buried treasures occasionally do surface. Maybe Charlotte's spirit is amazed at the interest we take in her, and desires her admiring public know all.